LONDON: New England captain Joe Root praised the parts played by predecessor Alastair Cook and all-rounder Moeen Ali after his first Test as skipper ended in a thumping 211-run win over South Africa at Lord's on Sunday. Off-spinner Ali took six for 53 as South Africa, set 331 for victory, collapsed to 119 all out inside 37 overs with more than a day to spare as England went 1-0 up in this four-match series. His return gave Ali overall figures of 10 for 112 -- the first 10-wicket match-haul of his 38-Test career. Although Root struck a brilliant 190 in England's first innings 458, it was Ali who received the man-of-the-match award after he made 87 in that same innings to accompany his bowling feats at Lord's. England lost seven wickets before lunch on Sunday's fourth day after resuming on 119 for one. But with opener Cook, England's all-time leading Test run-scorer, making 69 and wicket-keeper Jonny Bairstow 51 they still compiled 233 in their second innings. In total, 19 wickets fell Sunday on a Lord's pitch taking sharp spin and Root, asked for his view of an extraordinary day's play, told reporters: "I think what it does tell us is how well guys played last night –- Cooky, Keaton (Jennings) and Gary (Ballance). That 100 runs coming into today, I think they made the wicket look a lot easier than it was -– and probably it was worth double. They need a lot of credit, and obviously the way Moeen and the rest of the guys bowled today was brilliant." This match saw Ali become the fifth quickest player, in terms of matches played, to complete the all-rounder's double of 2,000 Test runs and 100 wickets. Sometimes criticised for being too expensive with the ball, Ali -- who made his name with Worcestershire as a batsman -- nevertheless has the happy knack of dismissing leading top-order players, with his first innings haul of four for 59 including the wicket of Proteas star Hashim Amla. With left-arm spinner Liam Dawson selected as much for his ability to keep things tight as take wickets, Ali had the freedom to attack at Lord's. 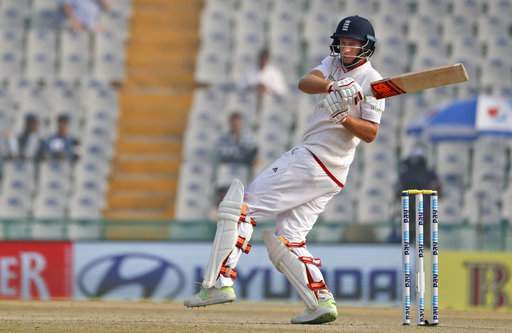 "That's when he's at his best, when he is aggressive," said Root. "He was outstanding." Root added: "If you ask Mo, he'll always tell you he feels he's a batter that bowls. The great thing about our top seven is we have two really good bowling options (in Ali and pace bowling all-rounder Ben Stokes). That's a real luxury, and it's great to see him (Ali) being so positive when he got the opportunity ... it just gives us great depth." Ali was giving the honour of leading England off the field, with his bowling performance ensuring he has a place on the Lord's honours board that records all those who have taken five wickets in an innings and 10 in a Test at the 'home of cricket'. "Yep, it was good –- a bit embarrassing –- but to do that, especially at Lord's, was a great feeling," said Ali. England, who named an unchanged 12-man squad including uncapped Middlesex seamer Toby Roland-Jones for the second Test, which starts on Friday, now travel to Nottingham in an upbeat mood.